EAST VILLAGE — The neighborhood’s red-tailed hawks — who were displaced from their home on Avenue B because of an upcoming building renovation — have found a new place to call their own and could start laying eggs next week, local birdwatchers said. 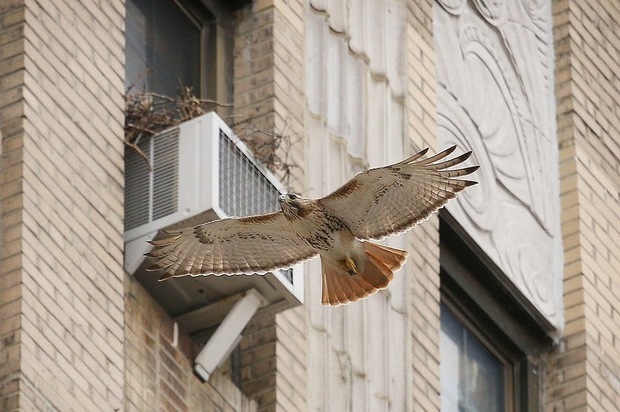 The hawks — nicknamed Christo and Dora by neighborhood birders — have recently been spotted at the Ageloff Towers on Avenue A between East Third and East Fourth streets, where they are building a nest on a 12th-floor air conditioner. "I just think it’s an amazing thing to have and I hope they stay," said Eddie Falcon, a handyman who has worked inside the building for more than 30 years. The raptors originally settled into the Christodora House on East Ninth Street and Avenue B last year and hatched three offspring from a nest built on a seventh-floor air conditioner. Residents regularly saw the hawks hunting rats, pigeons and squirrels at Tompkins Square Park. But last month, bird watchers noticed that the hawks’ nest had been removed twice and replaced with metal spikes, apparently to discourage the raptors from nesting on the unit. The building’s property manager said the nest was removed so that the air conditioner could be repaired. A facade renovation scheduled to begin in April also made the space less than ideal for the hawks, she added. 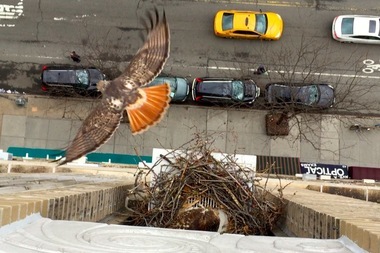 Rob Mastrianni, an East Village resident and an urban park ranger who keeps track of Manhattan’s birds of prey, said Christo and Dora began nesting at the Ageloff Towers earlier this month, a move that has delighted some of the building’s residents. “It’s kind of neat to have [hawks] come all the way down to us, and our very building. I mean, he had a lot of other buildings to choose from,” said the raptors’ new next-door neighbor Robert Bryan, who has lived in the Ageloff Towers since 1976. The owner of the 12th-floor apartment could not be immediately reached for comment. Mastrianni called the move "bittersweet." He was happy to see the hawks settle into a new, nearby location, he said, but worried about future fledglings, which are usually “very clumsy” when they begin to fly. “Avenue B was kind of a quiet street, just a couple of wing beats away from the park,” Mastrianni said. Avenue A, on the other hand, is a much busier street and he worried that young birds still learning how to fly could end up on the ground or by the bus stop across the street, he explained. "Maybe they'll just fly to the roof of the building across the street, the Key Foods," he said hopefully. Mastrianni said the nest has grown to a good size and is now visible from across the street, which means the hawks will probably start laying eggs in about a week or two. The incubation period is about 30 days, he added.